And when you have 3 grandchildren visiting, the LAST thing they want to do is sit around inside with airconditioning comfort. No sirree! We must do SOMETHING. So that something turned in to riding the Philly Double Decker Big Bus and see all the sights! Not the air conditioned trolly. Nope! Must be on the top of the bus in the 100 degree heat. Thankfully we went in the morning and there were few riders. Go figure. I've done this bus tour at least 4 times with guests when coming to Philly. It's always fun and I learn something new each time. But this time ... THIS TIME ... I had a real treat. 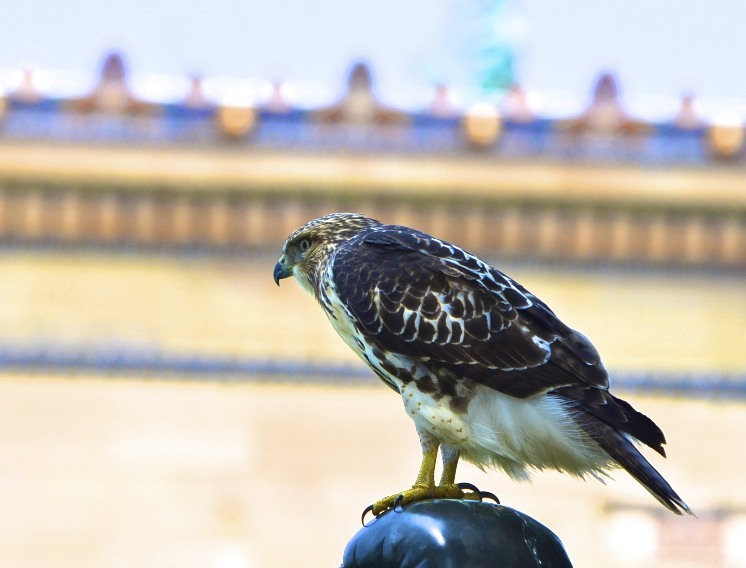 OK ... fellow birdie bloggers ... tell me which hawk is this. Is it a Cooper's? Imagine my excitement when I spotted this guy at the Philadelphia Museum of Art. And so condescending to those below him. I'm not sure how Rocky felt about that. I can just hear Rocky calling out: Adrian! Get him off of me! Sorry Rocky, clearly this Hawk was the Champion of the day! Thanks for dropping by, dear friends. And no, we didn't run up the 72 Rocky Steps at the museum. Oh how cool. Great post. Marvelous captures and I do love the hawk! What a beautiful bird he is, Reena! Hope you have a great weekend! Happy SWF! Very beautiful!! And WHAT?? No steps?? Dont you know, it is all part of the experience?? BOL!! Just couldnt resist that!! 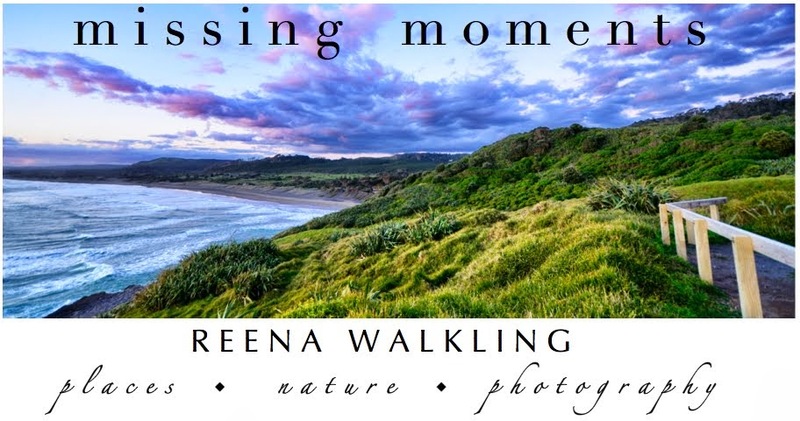 Amazing photos, Reena. I don't know what kind of hawk it is but it's magnificent! Sorry about the heat. We would love to have just a bit of it here! WOW .. great shots of the Hawk. Have a happy weekend... stay cool !! You never cease to amaze with what you see, AND the way you capture it and share it. 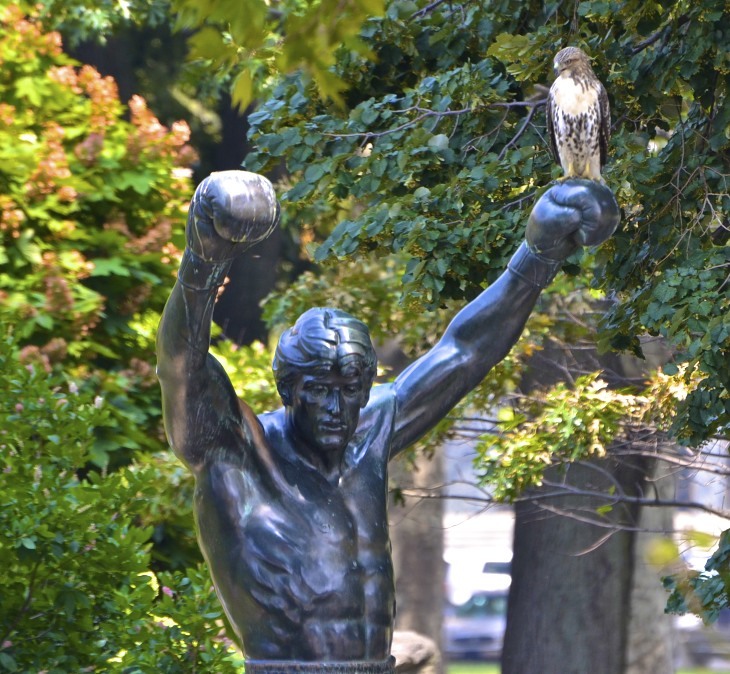 The hawk is just beautiful, and on Rocky's glove to boot! What a great little tease and reveal. Hi there - cant be of any held with the hawk (sorry!) - but I can tell you that it a great set of pictures. Looks like a Cooper to me. Nice shots. Beautiful shots, and I love where he chose to survey his kingdom. Isn't it exciting when you see a critter that you didn't expect to see, in a place where you didn't expect to see it? Ah the things we will do for kids! he is BEAUTIFUL!!! i love how you led up to the fact he was perched on Rocky's glove. just makes me LAUGH!!! i at first thought coopers too. 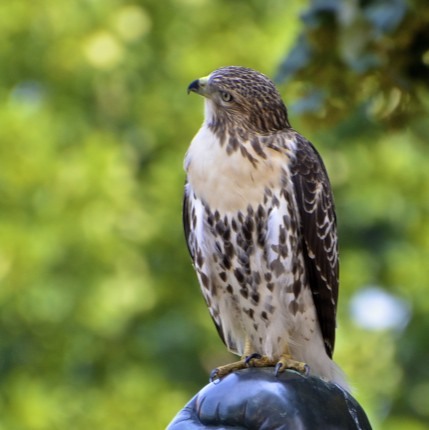 but after consulting my ever-so-thorough and sometimes confusing Crossley ID guide, i have to agree with the commenter above that said red-tailed hawk. the white chest bib he's wearing definitely is red-tail. the coopers has spots all the way from throat down. Sounds like a fun time - albeit a hot one - with your grandkids. I'm no expert - but I think it's a red-tailed hawk??? Enjoy your time together! Don't you love how kids are oblivious to the weather!! Ha! 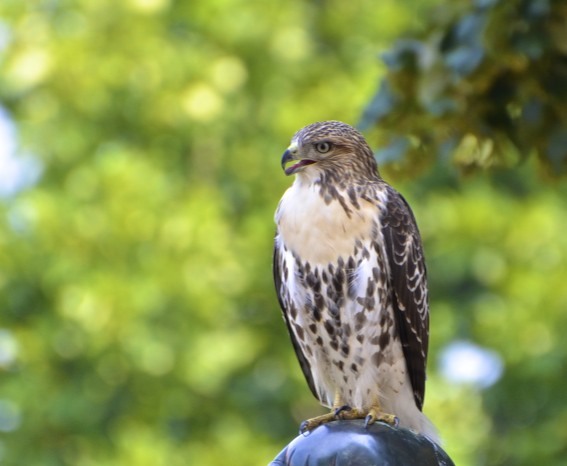 Love your photos of the hawk. They are so pretty. We have lots here too but they look a little different then this one. Great captures! Entertaining children in summer heat is challenging, especially this year. Sounds like you are having lots of fun despite the heat. Wow what a capture! Oh Yes, we headed to a cave in the local area...53° it was on the inside...That was the best hour we spent and surprising the grandkids loved it...Ahhhhhh! These pictures are stunning of a beautiful hawk! 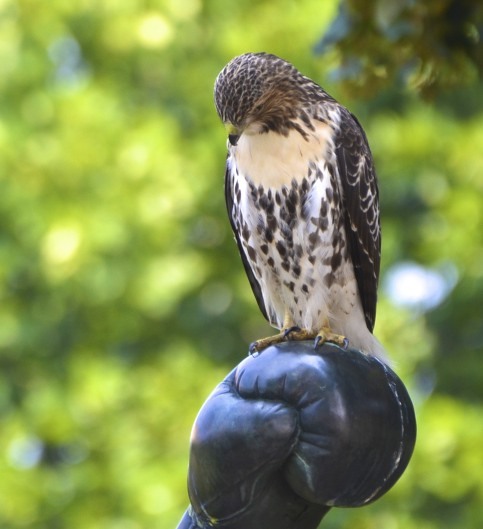 This makes me wonder what sort of vermin are at the museum, because I doubt this hawk was sitting there admiring the view. I love hawks! We have a Cooper's Hawk that hangs out on our power lines in the winter, and a pair of Red-tailed Hawks who live here year-round. He's so beautiful. Wonderful captures! Thanks to your grandchildren's adventurous spirits you did not 'miss this moment'!! Fabulous picture and I beleive the yellow around the beak might be the sign of a Cooper's but I'll check my birding book. you have been rewarded.....for allowing the grandchildren to torture you!! 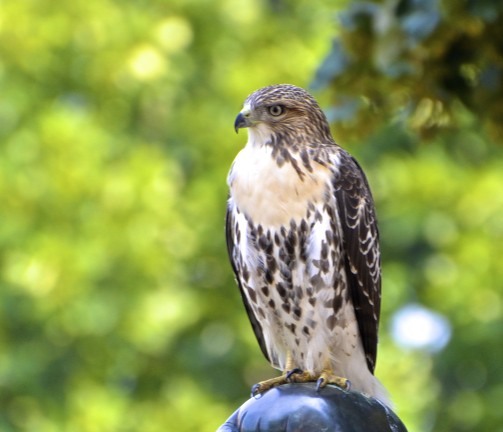 awesome shots of the red tailed hawk!!!! Isn't that a fitting spot for him to survey his kingdom? I didn't know there even was a Rocky statue! Loved the gradual reveal! Wow, stunning shots. He's a beauty. I'd have been super excited too. Temps supposed to be at 104F here today, I can't do this heat. that is hilarious!! how nice of him to sit there long enough for you get get these great captures! What a sight, really great capture! And I really enjoyed your amazing photos of the butterflies below, beautiful! what a gorgeous bird. those shots on the rocky statue are great!! A beauty of a bird; and that last shot is priceless. Wow, wonderful captures of the Hawk. And what a neat place to land on Rocky's statue. I can not imagine riding on the top of a tour bus in this heat. You are great. These shots made braving the heat all worth it! Wonderful!!! Sorry, don't know my hawks but I always find them stunning. Those are amazing shots! I would guess red-tailed, but am too lazy to get up and go look at my books! what a fantastic gift you were given!!! What a great sport that guy was. Great shots! Fabulous encounter and super images. These are just wonderful shots. That is a wonderful bird, I love your photos of him. I've been hearing one flying around overhead but haven't spotted him yet. These are great photos! good sequence of pics. You had to be off the bus at the time - right? I was lucky to get a few shots of a hawk this year. Maybe they are coming back. Oh he is so beautiful! What great shots. Today i think I saw an eagle. Well, 2 really. One was flying away and I could swear it had a white head. The second was in the neighbors hard eating something! No camera in my hand! Such amazing shots! I love that last one that shows where the bird is perched. omg....that hawk is amazing ! what a fantastic grandma you are to do what the grandkids wanted to do in this heat....wow. i'm not sure i could have handled it. Wow - great photos and beautifully presented. He's magnificent - and what amazing captures you got! What a magnificent creature! Great photos. Excellent post and photos, too. Great post! Like the way you sequence the shots. What a fabulous post .. love the reveal at the end! Beautiful photos. Excellent capture on the statue, too. Hi Reena, I found your blog through Tricia Hays blog. Fab photos! I have really enjoyed poking around in here. I will be back! Haha great post and GREAT bird!!! Ha! I can hear him too, cute! Lovely captures, getting a good shot like that isn't easy! i love love love these! i love hawks! now those were some MOMENTS! excellent! I really have no idea, but it looks like a falcon to me. Either way, those are some amazing photos of an awesome looking predator. You must have been surprise by this winner, indeed ! It is magnificent, though, and you did quite an impressive job by taking those pics, bravo ! I love this series. It looks like a Cooper's hawk to me. Here's where we enter the twilight zone. I was looking at a series of hawk pictures for my B&W weekend when I happened to scroll down to last weeks' weekend reflections and saw your hawk. When I rescanned my images a few weeks ago, I did some research because I wanted to know which hawk. Yep, it's a coopers.